Doc Brown didn't have a time-travel backup plan. In light of the incredible success of our last Physics Challenge Problem (we received several responses), we here at the Virtuosi have decided to reinstate what was nominally a "monthly" contest. In addition to a brand-spankin'-new problem (with "prizes", see ), we have also tried to make a nice collaborative environment for discussing interesting physics problems and posting your own solutions. So I will discuss our new problem and then I'll throw it over to Alemi to discuss the goal of our new Physics Challenge webpage. Our last challenge problem (here, with winning solutions) was deemed a bit "unrealistic" by many because it assumes that you were shipwrecked on a desert island with a CRC handbook! What a ridiculous situation! Fear not, dear readers, we have heard your complaints and have adjusted accordingly. Our new problem relies on a far less ridiculous assumption. Assume you have created a time machine out of a DeLorean . You are sure it will send you back in time and, causality-be-damned, you are ready to give it a test drive. But you are less confident in the machine's ability to take you exactly when you want. Additionally, the positive tachyonic chrono-coupler is a bit finicky - meaning, of course, that there is a non-negligible chance that once you go back in time, you may never be able to come Back to the Present. Thus, there is a chance that your time machine will have worked but no one will ever know! As an unabashed narcissist, you find this totally unacceptable! But first and foremost, you are a scientist. As a scientist, your challenge is to design a strategy that would allow you to convince your present-day scientific peers that you did travel back in the time even if you are stuck in the past. 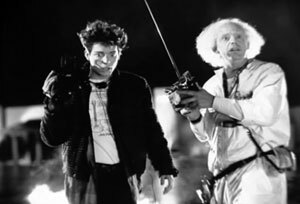 What could you build/make/leave in the past that would be most likely to convince modern scientists that it had to be from a time-traveler and not just some hoaxer? How long would your strategy be effective? Would it work if you were stuck ten thousand years in the past? What about a million years in the past? What about 100 million? Though this is an inherently silly problem, we feel that the idea behind it is a very interesting one. What could one motivated person do/build/make that would survive a long time into the future? Also, the winning solution will be submitted as a policy White Paper for all future time-travelers. So that's the new problem. You can find the "official" posting here. I now cede the floor and my remaining time to the gentleman from Wisconsin. So, we've had this blog going for a while now, and we get a decent number of comments on our posts, but felt as though something has been lacking. A certain sense of community. Over the past year, we've done some neat things here, and now it's your turn. Step right up, because we've just launched a google groups: TheVirtuosi where we hope people from all corners of the globe will gather to discuss their kooky physics projects. Have you recently explored the physics of cats? Launch a discussion. Do you have an idea but need some help investigating it? Create a discussion and query us and all of our fantastic readers. Have an idea for a blog post you want to see? Let us know. Want to take a stab at solving one of the newly minted Physics Challenge problems in public? Go for it! I know the site is sparse now, but we'd really like to build a little bit of a community here, so please, post away. You all have already bookmarked it I'm sure, but a permanent link has been added to the top of the sidebar as well. That is all. These "prizes" will no longer be as exciting as the CRC from last time, for several reasons. First of all, we are all poor grad students and have no money. Secondly, the winners from last time lived as far away from us as physically possible and it's expensive to ship heavy things. So what can you expect to win? Well, you could win a "certificate of accomplishment" which would just be drawn in crayon by one of this. But it will be made with love! Or you could win a floppy disk with a recording of my very own version of the Jurassic Park theme. The surprise is part of the fun (I'm told). Quoth the most famous chrononaut of our time, Dr. Emmett Brown: "The way I see it, if you're gonna build a time machine into a car, why not do it with some style?"